Markets continued to rally this past week in a “buy the rumour” anticipation of an announcement of a U.S.-China trade deal. The White House said on Friday after three days of trade talks with Chinese officials in Washington that the negotiations made progress on numerous key issues but significant work remains. As soon as the date of the summit between Trump and Chinese president Xi Jinping is announced, we’ll begin the countdown to the end of the “Trade War rally”. This past Friday close brought the major U.S. indexes about 2% from all-time record highs. The more investors fall into disbelief over how long this V-shaped recovery is persisting, the higher the trading algos seem to want to push equity prices. The macroeconomic news this week was highlighted by the Non-Farm Payrolls Report which showed that the U.S. created 196,000 new jobs last month after a swoon in February. The increase exceeded the 179,000 forecast of economists. The increase in jobs in February was revised up to 33,000 from 20,000. 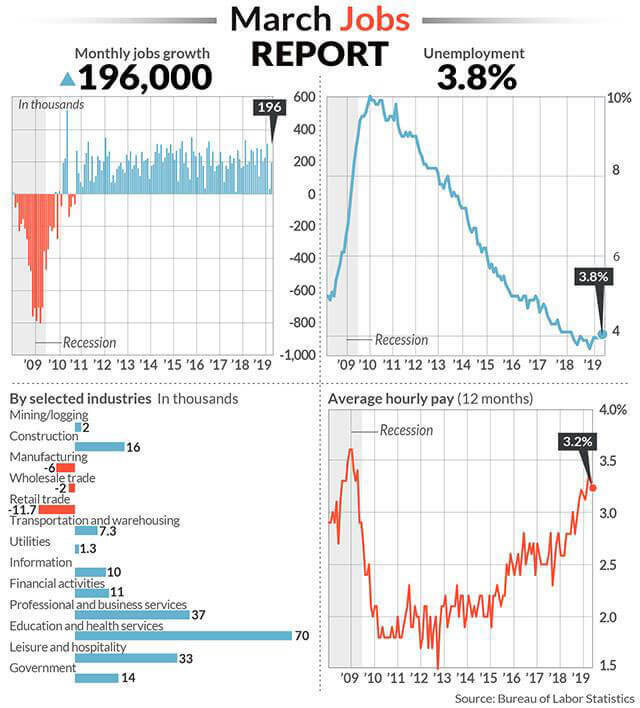 January job gains were little changed at 312,000. Jobs are a lagging economic indicator, but in an equity bull run good numbers only further fuel buying. The Friday post-jobs report close on the equity indexes left the majors (S&P 500, Nasdaq) a stone’s throw from the 2018 all-time record highs. The figure below shows that the unemployment rate has likely gotten as low as it will go for this expansion. Salaries are trending higher as the labour market tightens. This is good short-term for the economy, but longer-term inflationary pressures will mount. The bond market will price in higher inflation and the Fed will likely not be able to maintain its dovish outlook should wage inflation show up in the PCE measure. 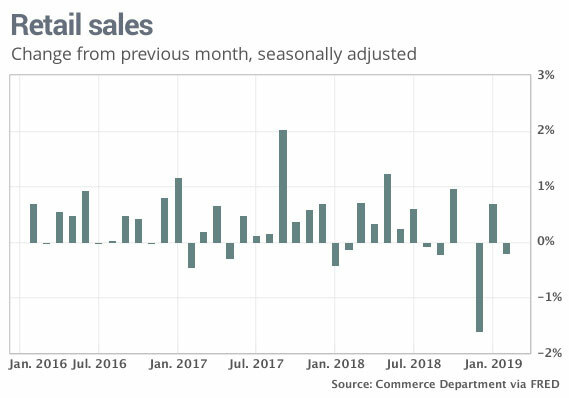 Sales at U.S. retailers fell in February for the second time in three months in another sign of a slowdown infecting broad swaths of the economy early in the new year. Retail sales dropped 0.2% last month (vs +0.3% expected), hurt in part by a severe cold spell across the country. The ISM said its manufacturing index rose to 55.3% last month from 54.2% in February. The index for new orders jumped 1.9 points to 57.4%, while production rose 1 point to 55.8%. Employment surged 5.2 points to 57.5%. Sixteen of the 18 U.S. manufacturing industries surveyed by ISM expanded in March. There is nothing in the details of the data or the comments to make us think that the expansion is going to come to an end anytime soon. Business inventories rose 0.8% in January, the second month in a row stockpiles grew at that rate. The ratio of inventories to sales edged up to 1.39 from 1.38. 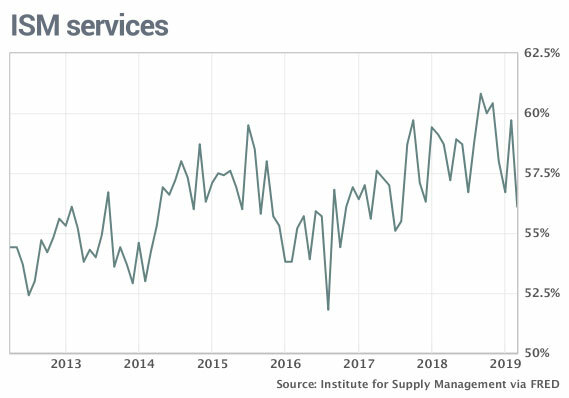 Recall that at the top of an economic cycle the inventory/sales ratio tends to spike higher and demand cools off before companies cut back production. Orders for durable, or long-lasting, goods fell in February (-1.6% vs. -2.1% expected) for the first time in four months and business investment continued to soften, reflecting a slower U.S. economy early in the new year. Motor vehicle sales reached a seasonally adjusted annual rate of 17.45 million in March, up from 16.57 million in February. That’s the highest reading in three months and represents a recovery from a downbeat start to the year. 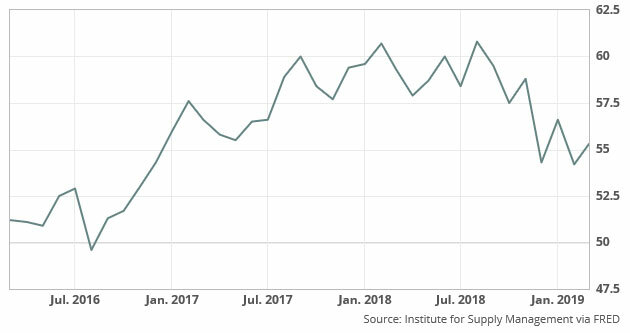 The ISM non-manufacturing index slipped to 56.1 last month from 59.7 in February, which was among the highest readings in the past decade. The data are consistent with moderate rather than dramatic slowing in the economy. This weekend we did not have time to write on a market theme. Bill and Owen conducted strategic meetings in Hilton Head on developing our investment management service, as well as ways to offer our readers more insights and tools for their own personal trading. Our focus is to provide independent thinking using our market savvy, fundamental analysis of the economy (as well as all the individual companies we track), and technical trading signals. We have agreed that providing original content in our newsletters is the most useful service that we can provide as independent, objective asset managers. We therefore will be providing in-depth reports on companies that we esteem merit an allocation in investment portfolios. Having a good vision of the markets includes maintaining an up-to-date universe of investable companies. Our master list includes all companies that can be bought in U.S. dollars on one of the American exchanges. We cleaned our universe this week-end to remove de-listed companies over the past 3-months. In addition, we modified tickers for recent take-overs (like Barrick and Randgold) and added new listings (Lyft, Dell, etc). We include all world companies with liquid shares trading in the U.S. (either direct company listings like for Toyota or via ADRs). 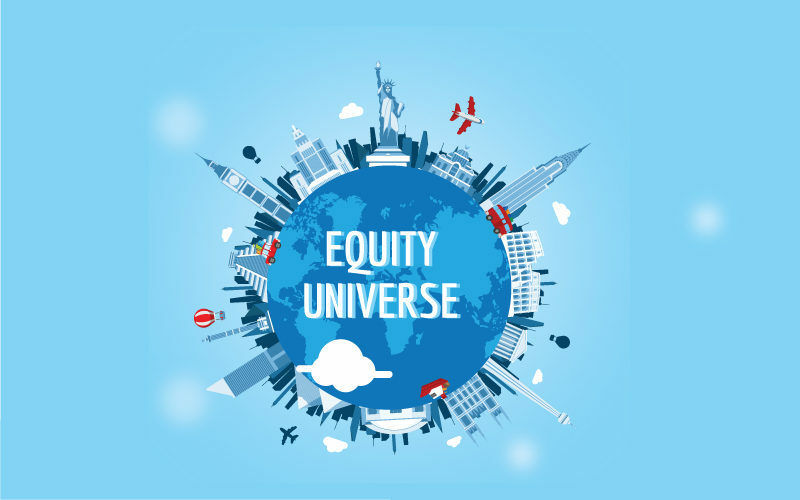 Our current universe is now 5,060 investable companies. Our job is now to pull out the winners! Here is our full universe. We will incorporate these companies into our models in the coming week. As always, send us a message if you see a company that is missing.